...this photo. I took it the other day whilst on a stroll with the munchkin. We were walking along a sidewalk lined with these leaves/bushes. A few minutes into it I noticed the little one's wee hand sticking out, grazing the leaves. 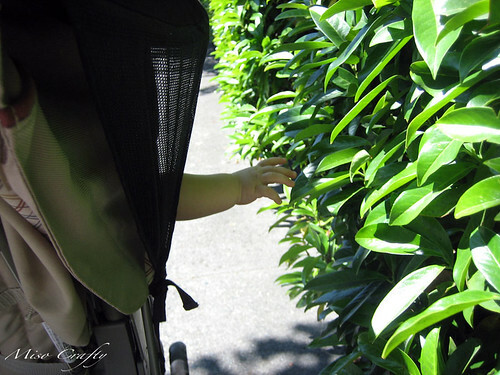 Normally I don't approve of my little one sticking his hands and arms out of his stroller for fear that he'll either get them caught on a passerby or that he'll take something and shove it in his mouth. But this time I let it slide. I thought this was too cute to pass up the photo op. So as stealth as I could be I grabbed my camera, kept pushing, and snapped a few photos. Then I saw the look of sheer joy on his face as he felt the leaves on the tip of his fingers, which was new to him. Lately he's discovering so many new things and the innocent look of wonder and excitement brings a smile to my face and a new surge of love to my heart every time! - Japanese Sour Cherry Tea. Not really a warm weather beverage, but still oh so tasty!